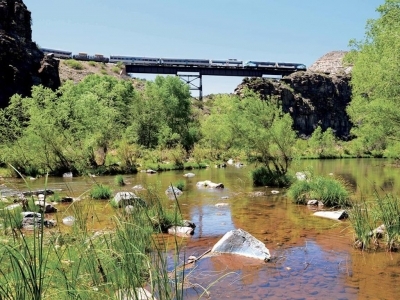 Located in the red rock country near Sedona, Verde Canyon Railroad’s rare ribbon of rails runs through a dramatic high desert landscape adjacent to a precious riparian ecosystem. Since 1912 this heritage railroad, sandwiched between two protected national forests, has existed in harmony in the wilderness through which it passes and the canyon’s native inhabitants. The scenic excursion first launched in 1990, offering a glimpse of this treasured landscape to visitors while providing an unforgettable encounter that transcends generations. The four-hour rail trip takes passengers on a 20-mile journey through exciting geology swathed in railroad history. The train’s handsome FP7 locomotives, built by General Motors Electromotive Division in 1953, are two of only 10 remaining in North America. These iron horses provide the muscle that powers the consist of restored vintage passenger cars through the picturesque Verde Canyon’s native flora and fauna, rugged, high-desert rock faces and stunning vistas … only accessible by rail. earn more about what makes riding the Verde Canyon Railroad so memorable and why any trip to the Sedona area deserves a stop off at the Verde Canyon Railroad in Clarkdale.